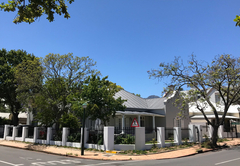 Just Joey Guest House is a Stellenbosch Bed & Breakfast providing accommodation in 7 guest rooms for tourists visiting the Cape Winelands region. 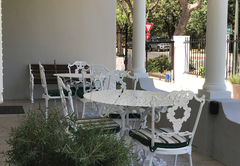 In keeping with the historic atmosphere and the romantic feel of this oldest of towns, Just Joey Guest House is situated in the historic centre of Stellenbosch, only a 2 minute leisurely walk to the nearest restaurants, shops, museums, botanical gardens, university campus, etc. 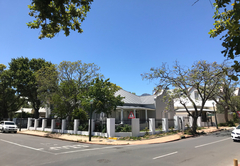 Cape Town, Paarl and Franschhoek are all just a half an hour’s drive away through the lovely vineyards of this famous wine region. A unique and peaceful setting. 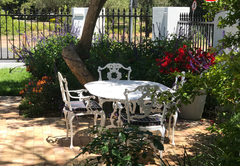 Just Joey is the perfect getaway for young and old, and offers true South African hospitality to holiday makers and business executives! 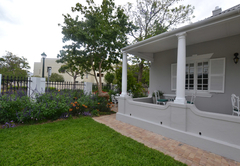 Our private Garden Room is very popular with honeymooners. 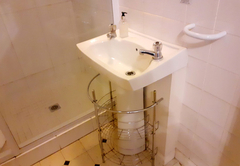 The bedrooms are all fully–equipped with all modern facilities, including en-suite bathrooms, telephone, television, hairdryer, heater, fan, modem point and tea tray. A same day laundry service is available. 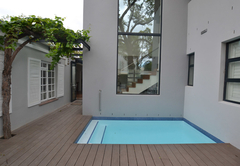 A sparkling pool in the beautiful Oak and Camphor tree garden offers cool relief during balmy summer days and the cosy fireplace is a treat in winter. 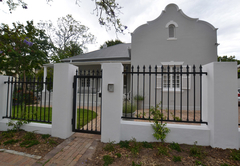 Just Joey is one of the leading Stellenbosch bed and breakfast establishments. The generous Cape breakfast (Health and English) from a menu, is our speciality. 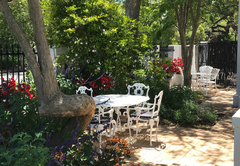 It is served in the sunny dining room or in our lovely garden. (Breakfast is included in the rates). Double or Queen beds. 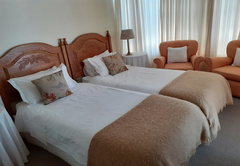 The bedrooms are all fully–equipped with all modern facilities, including en-suite bathrooms, telephone, television, hairdryer, heater, fan, modem point and tea tray. A same day laundry service is available. 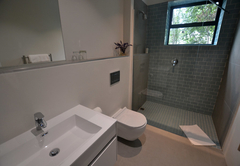 Separate garden room. 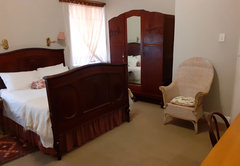 The bedrooms are all fully–equipped with all modern facilities, including en-suite bathrooms, telephone, television, hairdryer, heater, fan, modem point and tea tray. A same day laundry service is available. Single Bed. 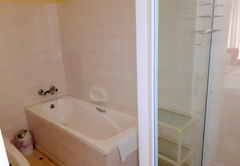 The bedrooms are all fully–equipped with all modern facilities, including en-suite bathrooms, telephone, television, hairdryer, heater, fan, modem point and tea tray. A same day laundry service is available. Twin beds with the option of a sleeper couch. 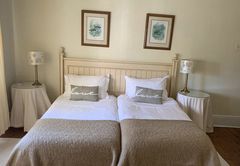 The bedrooms are all fully–equipped with all modern facilities, including en-suite bathrooms, telephone, television, hairdryer, heater, fan, modem point and tea tray. A same day laundry service is available. Excellent value for money. 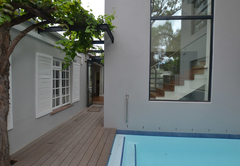 Comfortable, unpretentious, staff very welcoming and efficient. We enjoyed our stay! Needs a face lift. Looking very tired but staff good and welcoming. Response timeJust Joey Guest House typically responds to requests in 5-10 minutes.